The support for a blogger hounded by death threats has intensified with some high profile web experts calling for a code of conduct in the blogosphere. The female blogger at the centre of the row has been shocked to discover that hers is not an isolated incident. It has led her and others to question some of the unwritten rules of blogging. It could force a re-examination of the way the tight-knit blogging community behaves. 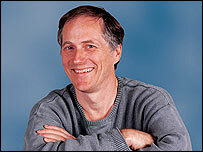 Among those calling for a bloggers' code of conduct is Tim O'Reilly - one of the web's most influential thinkers. He told BBC Radio Five Live that it could be time to formalise blogging behaviour. "I do think we need some code of conduct around what is acceptable behaviour, I would hope that it doesn't come through any kind of [legal/government] regulation it would come through self-regulation." While condemning the bloggers who issued the threats, Mr O'Reilly was keen that the whole blogosphere should not be tarred with the same brush. "The fact that there's all these really messed-up people on the internet is not a statement about the internet. It is a statement about those people and what they do and we need to basically say that you guys are doing something unacceptable and not generalise it into a comment about this is what's happening to the blogosphere." Ms Sierrra has personally witnessed the usually harmless feuding that is part and parcel of blogging take on an altogether more sinister tone, with threats of a violent and sexual nature gathering pace over the last month. She agonised over whether to publicise what had happened to her, she told the BBC News website. Since describing the campaign against her, she has been shocked to discover that cyber-bullying is widespread. "As well as around 900 comments on my blog and hundreds of comments on other blogs, I have received around 300 personal e-mails and about 70% of them say they have been through a similar thing," she told the BBC News website. Among the messages is one from a blogger Ms Sierra described as "far more prominent than me" who has been avoiding industry conferences because of persistent online threats. Ms Sierra herself pulled out of a planned appearance at ETech in San Diego this week. She believes it is time the technology blogging community sat up and took notice. "I think there is a culture of looking the other way. When other prominent people look the other way it is creating an environment that allows this type of behaviour," she said. She also thinks it could be time to re-examine whether the blogosphere needs to be completely uncensored. "There is an unwritten rule in the blogosphere that it is wrong to delete nasty comments. It suggests that you can't take criticism but now there is a sense that this is nonsense," she said. 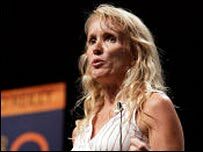 Denise Howell, a US lawyer and blogger, believes that the blogosphere is no place for legal requirements. "The tools of the Live Web have made it easier than ever for ordinary people to communicate and express views in their individual capacities, and to provide platforms, e.g. on their blogs, for others to do so," she said. "I think anyone who enjoys any aspect of the Live Web would celebrate this fact, and agree its vitality would be impaired if the law expected or required these ordinary people to envelop themselves and their sites in elaborate legal provisos and conditions if they hope to be shielded from potential responsibility for the bad acts of others," she said. The Kathy Sierra situation is, she said, "forcing bloggers to examine their moral compasses on a number of fronts". But, ultimately self-regulation is the only way forward, she believes. These people are interested in rage and they think that if you aren't enraged then you are part of the problem. It seems that they hate my optimism. Although, as a female blogger, she has not personally encountered bullying or sexism, she does think it can be tough to be a woman online. "Despite my fortunately good experiences, I do think it's harder in some ways for women to blog. For women with families, it's constantly in the back of your mind that you're putting not just yourself but to some extent your family in the public eye," she said. It has long been accepted that online behaviour differs from the behaviour people would exhibit in the real world due, largely to the anonymity it allows. Technology blogger Sam Sethi agrees that blogging can bring out the worst in people. "These young geek guys they feel that that they can say what they want and do it with anonymity. It can bring out the worst character behaviour because they feel that they are hidden. He agrees with Tim O'Reilly that the time is ripe for bloggers to have a code of conduct and like fellow bloggers, has turned off the facility on his blog that allows for anonymous posts. "It could be that the time has come to professionalise what bloggers do," he said. "It is up to the community to agree the rules and then it would simply be a line at the top of the blog to say only show me sites that adhere to this conduct," he said. For Ms Sierra the reasons behind the campaign against her remain elusive. Other than being a woman, she can see only one other reason for the hatred she has experienced in the last four weeks. "They thought I was just too damned optimistic," she told the BBC News website. "These people are interested in rage and they think that if you aren't enraged then you are part of the problem. It seems that they hate my optimism. They think I am poisoning peoples' minds with my positive outlook," she told the BBC News website. Such nihilism and anger have led her to consider hanging up her blogging software for good.